What a crazy start to the Big Bash League season! Who would’ve thought that the Scorchers would lose their first two matches, the Strikers would get run down at home and the Renegades would be undefeated! Meanwhile the Hurricanes and Thunder are also flying high at the top of the ladder after the first two rounds. If you’ve survived the upsets that came in the early matches, then well done, you’re ahead of the pack! 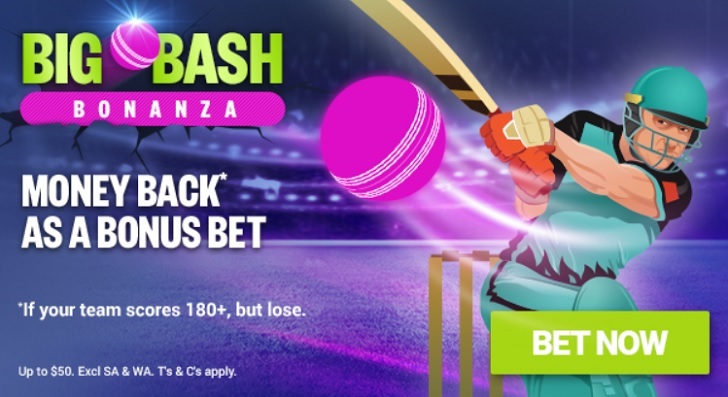 With Christmas bellies full, we try our luck again with our BBL08 Round 3 betting tips, starting on the evening of Boxing Day. On paper, this looked to be a cracking match up, but what a different spin it now has on it after the poor starts to the season for both teams, particularly the Scorchers. The most successful team in the BBL have not missed the finals in their history, but with a 0-2 start to the season, and some obvious holes in their lineup, the Scorchers are going to be desperate coming into this match. It’s a long way back from 0-3. Their bowling attack has always looked strong, with Jhye Richardson left out of the opening match, such is their depth with the ball. However it’s their batting depth which raises eyebrows. Sam Whiteman seems a long way from the required level, and with Michael Klinger missing out in the first two matches, it’s put incredible pressure on the middle order. With Mitch Marsh with the Test squad, there’s a massive hole in the batting order. Will Bosisto is probably not the saviour, and they seem unsure about where to bat David Willey. Expect to see them try something different in this match. Perhaps Josh Inglis comes in to replace Whiteman, and maybe Ashton Agar gets a boost up the order. The Strikers had a good first win away against the Heat, but followed that up with a poor bowling effort against the Renegades. After posting a decent 174, they were unable to stop the onslaught despite Rashid Khan taking an incredible 2-13 from his four overs. Neser, Laughlin and particularly Stanlake were just awful. Stanlake has been monstered in both games this season, proving that smarts outweigh pace in the T20 format. Perhaps they’ll make a change and give Nick Winter an opportunity, or play an extra spinner in Liam O’Connor. Many pundits are predicting the Strikers to go all the way this season, but do the Scorchers really drop this match at home to go to 0-3? We'll take the value on the Scorchers for a little upset. The Sixers and the Stars clash on Thursday night and both will be keen for victory after coming off the back of respective losses on Christmas Eve. The Stars travelled to Hobart and set a moderate target of 155 that failed to challenge the Hurricanes. Glenn Maxwell and Nick Larkin threatened to post a massive score but both fell short of their fifties. Their problem is at the top of the order where the inexperienced Travis Dean and the out-of-sorts Ben Dunk struggled to get going. Perhaps it’s time to throw responsibility to Marcus Stoinis at the top of the order. He’s a man in form and a potential match winner. With the ball, the spin duo of Adam Zampa and international recruit Sandeep Lamichhane have performed well, but with Dwyane Bravo off the boil, the Stars have been unable to contain the opposition. The Sixers entered the local derby with confidence but didn’t come away with the points against the Thunder. The Thunder batted first and posted 169, that could’ve very easily been closer to 200 if they didn’t fall away late in the innings. In reply, the Sixers were just never in the hunt. Tom Curran added some respectability with an excellent 62 from 40 balls batting at number seven, but there was just too much left for him to do. Joe Denly and Moises Henriques have both failed to fire at the top of the order so far this season, and that’s put too much pressure on the middle order. Perhaps Josh Philppe will get the push up the order, along with Daniel Hughes who is a regular opener in Shield cricket. It’s a coin flip game according to the bookies, but with the game at the SCG, I’m going to lean towards the team with the better spinners. Steve O’Keefe has been good for the Sixers, but Zampa and Lamichhane are going to be a handful to play, and if Maxwell and Stoinis can fire, then I think the Stars can do the job. Two undefeated teams clash in Hobart on Friday night with the winner set to assume outright top of the table in BBL08. The Cane Train rolled on with a good win against the Stars on Christmas Eve. It looked like Glenn Maxwell was going to go ballistic with some power hitting, but the Canes reeled them in with a strong bowling effort. Jofra Archer is going from strength to strength, and emerging as one of the best quick bowlers in the world. He’s been supported by James Faulkner who is crafty at the top and tail of the innings, and Riley Meredith who is deceptively sharp and filling the void left by the season-ending injury to import Tymal Mills. With the bat, Darcy Short has continued his BBL dominance, while Matthew Wade, Ben McDermott and George Bailey have all played their part. The key man for the Canes to control is Thunder opener Jos Buttler. The UK import went big against the Hurricanes last season with two enormous sixes that were smoked out of the ground in his innings of 67. He’s coming off a brilliant 63 from 37 balls against the Sixers, and if he gets off the leash again, then the Thunder are going to post a huge total. Joe Root is due for a score, while Daniel Sams has been the other star for the Thunder, with both the bat and ball. Another man to watch is Fawad Ahmed who was very good with three wickets against the Sixers. Can he control the Hurricanes batting on the small square boundaries of Blundstone Oval? Sticking with the purple army to get the win here. There are several match winners for both teams who could greatly influence the game, but I think the Hurricanes have a bit more depth and they are executing their game plan very well at the moment. The final game of the round will see the Sixers back up once again as they head to Melbourne to take on the Renegades at Marvel Stadium. Two teams which I didn’t hold much hope for this season, but the Renegades have put in two strong performances so far. On paper, the loss of Finch and Harris to the Test side looked like a massive hole in their batting line up. Tim Ludeman has failed at the top of the order, and Cameron White and Tom Cooper haven’t really got going. It was left to Dan Christian and Mohammad Nabi to get the Gades home against the Strikers with a remarkable unbroken 6th wicket partnership of 94. They need to find someone up the order to get the ball rolling and back up their bowling which has been ok. Meanwhile the Sixers have lost two in a row over the Christmas period after starting the season with a win. The Sixers really lack talent across the board and their match-winners in Joe Denly and Moises Henriques are badly out of touch. Jordan Silk has been solid in the middle order, but he’s just not a match-winner. Steve O’Keefe has been a shining light with the ball, but they struggle with their 4th and 5th bowlers which exposes them to a big total. As I mentioned above, I don’t like either of these teams, but reluctantly can see the Renegades’ perfect start to the season continuing as I just can't touch the Sixers.